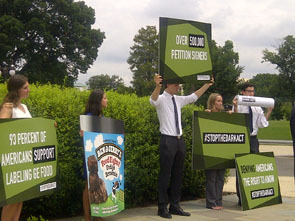 WASHINGTON, July 10, 2014— Ice cream maker Ben & Jerry’s promoted a special flavor, “Food Fight Fudge Brownie,” on Capitol Hill today, to support labeling mandates for genetically modified food. The company committed earlier this year to phasing out any ingredients in its products derived from genetically modified organisms (GMOs). Company co-founder Jerry Greenfield said the flavor will appear this month in Vermont Ben & Jerry shops, where $1 of every purchase will go into a legal fund to defend against challenges to the state’s GMO labeling mandate passed in April. From left to right: Ben & Jerry's co-founder Jerry Greenfield; Rep. Peter DeFazio, D-Ore.
Groups including the Grocery Manufacturers Association, the Snack Food Association, the International Dairy Foods Association and the National Association of Manufacturers have filed a lawsuit against the state of Vermont, saying the labeling mandate unconstitutionally compels speech and interferes with interstate commerce. Greenfield joined a pro-labeling rally today on Capitol Hill, where he and a representative from the Environmental Working Group (EWG) spoke against the “Safe and Accurate Food Labeling Act,” which is supported by the food industry and GMA. The bill was sponsored by Rep. Mike Pompeo, R-Kan. The bill would require that all new foods containing GMO ingredients undergo a review by the Food and Drug Administration (FDA). It would preempt any mandatory state labeling law, because foods would not need to be labeled if they are deemed safe by FDA. Critics of the bill have dubbed it the DARK Act, or the Deny Americans the Right to Know Act. 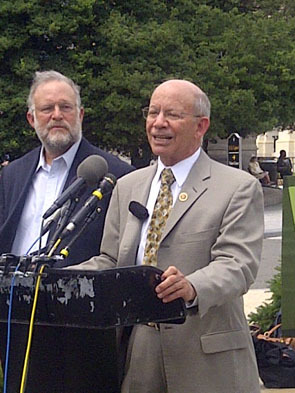 Rep. Peter DeFazio, D-Ore., the only member of Congress to speak at the rally, said consumers support the idea of required labels on GMO products. “Any other day my Republican colleagues would say, ‘We’re for states’ rights,’” he said, adding that resistance to labeling laws is the result of “well-funded special interests,’’ including from companies such as Monsanto, which makes genetically modifies seeds. Food and agriculture companies spent millions of dollars to fight labeling ballot initiatives that ultimately failed in California and Washington. So far, only Vermont has passed a GMO labeling law without any “trigger” clauses requiring neighboring states to do the same. DeFazio said once more states pass GMO labeling laws similar to Vermont’s, some members of the food industry would back down from fighting the mandates. “The industry’s going to freak out” once largely populated states pass laws to mandate GMO labeling, he said. The labeling campaign in Oregon recently filed 150,000 supportive signatures to put a referendum on the issue on the ballot in November, more than the legal requirement. DeFazio and Sen. Barbara Boxer, D-Calif., have introduced competing legislation to Pompeo’s bill that would require a federal label on genetically modified foods. Another Oregon Democrat, Rep. Kurt Schrader, on Tuesday spoke out against GMO lageling. During a House Agriculture subcommittee hearing on biotechnology he said that GMO labeling mandates are unnecessary and potentially harmful.